A preliminary estimate of China’s purchasing managers’ index (PMI) that reflects business conditions in manufacturing, shows the sector started to grow after four months of contraction, with exports remaining sluggish. The HSBC China February flash manufacturing PMI jumped to 50.1, a level well above the expected 49.5 and up from January's final 49.7. However, exports shrank at the fastest rate in 20 months to 47.1, according to the survey, issued Wednesday. While Chinese manufacturing showed signs of expansion, exports from the world’s second largest economy remain slack. Weak foreign demand and deepening deflationary pressure mean considerable risks for manufacturers. "Today's data points to a marginal improvement in the Chinese manufacturing sector going into the Chinese New Year period in February," Qu Hongbin, chief China economist at HSBC in Hong Kong said, commenting on the survey. "However, domestic economic activity is likely to remain sluggish and external demand looks uncertain. We believe more policy easing is still warranted at the current stage to support growth." Output and new orders also fell, though they showed a faster rate of increase than the previous month. The Australian dollar advanced after the report, as better demand outlook in China is positive for the Australian economy and currency since Australia's major share of export revenue comes from commodities shipments to China. Shares in China and Hong Kong remained slightly lower on Wednesday. The Flash PMI report is based on 85 percent to 90 percent of responses to surveys sent to more than 420 manufacturers. 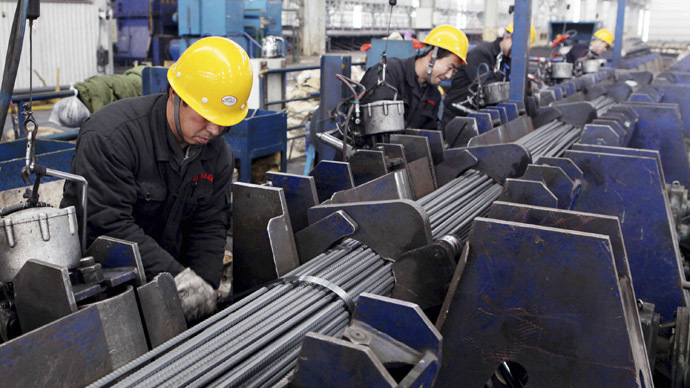 China’s economy grew 7.4 percent in 2014, is its worst performance since 1990. The country’s slowdown was triggered by such factors as a cooling property market, falling energy prices, industrial overcapacity and a lack of demand. Forecasts by economists expect the economy to fall further to 7 percent in 2015. Earlier in February, the central bank reduced the amount of cash banks have to hold as reserves. Analysts expect more rate cuts and reserve ratio reductions in the coming months, especially after this month’s data showed that growth in China's broad M2 money supply slumped to its lowest on record in January.